This webpage is devoted to the National Public Alerting System initiative. 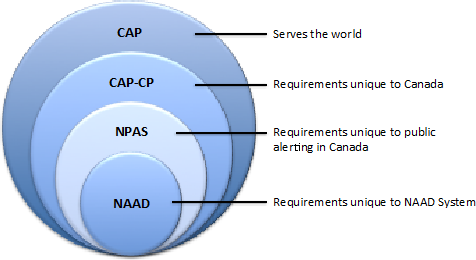 This document presents the current collection of specifications, policy decisions and recommended practices related to the Common Look and Feel (CLF) of public alerts associated with the National Public Alerting System (NPAS) initiative; for alerting authorities, last mile distributors (LMD), and developers of applications that support the distribution of Canadian public alerts to the CLF objectives. Additionally, this document includes a limited number of forward leaning statements relating to efforts to overcome recognized near term challenges associated with achieving CLF objectives. The NPAS all channel communications model supports alerting authorities publishing a single alerting information file to a central collection point for distribution through a variety of communications mediums to the public. As illustrated below, there are five key functions within NPAS: Create an alert, aggregate all alerts, share through efficient communications channels, distribute to the public through a variety of media, and receiving the alert through a variety of communications tools and applications. Distribution of alert messages is voluntary, and the alert authority has limited influence over the channels the alert message will be distributed through once they are in the public domain. As with all digital content, alert messages may also be redistributed through multiple communications media by other LMDs and the public. In some cases alerting authorities maintain distribution systems, through which they may distribute the alert messages of other alert authorities. Alerting authorities should note that all alerts issued in NAAD System and the Alberta Alert System will also be available through the Multi-Agency Situational Awareness Systems - National Information Exchanges (MASAS-X), which serves the Canadian public safety community. 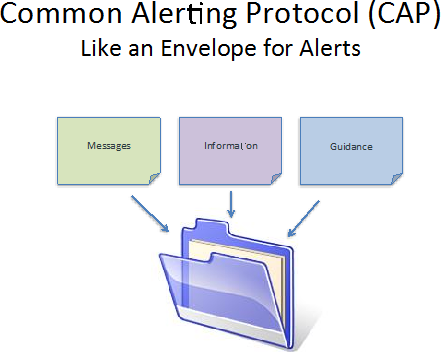 The Common Alerting Protocol (CAP), which is an alerting message protocol, plays a key role in the NPAS communications model. CAP defines a single alert message file which includes a collection of one or more audience alert messages (and referenced content) to be presented to the public. Additionally, sufficient information, along with some supplemental guidance, is present for the last mile distributor to determine if the message(s) is relevant for distribution through its medium(s). See illustration. CAP is replacing the use of email, fax and phone calls between alerting authorities and LMDs, because it supports the automated processing and distribution of alert messages by LMDs, and more efficient and complete distribution to the multitude of LMDs. 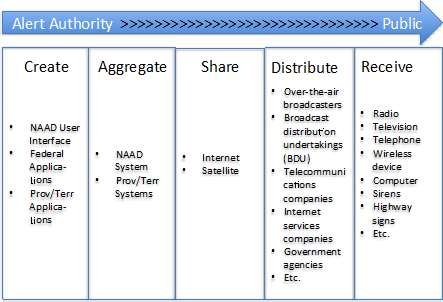 The Common Alerting Protocol is but one of a number of specifications required by the NPAS, and there is a hierarchy to them as illustrated below. The international CAP standard is purposely flexible to the needs of all countries, all systems, and all communities of practice. The Canadian Profile of the CAP (CAP-CP) is a set of rules and managed lists of values that are recommended for all uses of CAP in Canada. This NPAS document provides additional rules and guidance specific to public alerting, but not other uses of CAP-CP. System specific specifications, such as the one for the NAAD System, identify the versions of the higher level documents supported, technical specifications for distribution channels, etc. Each document is to comply with the one above it in the hierarchy. The documents below are more prescriptive than those above. An objective of this approach is to ensure that the requirements of one community of practice do not negatively impact those of another, while establishing sufficient rules to ensure interoperability between the systems. E.g. Authorities can impose the inclusion of a broadcast immediately flag for public alerts associated with NPAS without burdening issuers of CAP-CP compliant alerts within the Multi-Agency Situational Awareness Systems (MASAS), where it would serve no purpose. NPAS is to also cover end-to-end public alerting system objectives whereas the NAAD System specification can be limited to system specific details like URL's, digital signatures, heartbeat, etc. Additionally, and whereas changes to CAP and CAP-CP may require an engineering change, changes to NPAS and NAAD System specifications are more likely to require only configuration changes. This approach also supports decision making closest to the requirements, by the people best suited to make such decisions. i.e. The international CAP community does not define system specific requirements for NAAD System, and NAAD System changes do not result in changes for international users of CAP. Additionally, CAP “layers”, which are simple extension mechanisms for adding more nonstandard information to a CAP alert message, may be used. Alerting Authorities may define CAP <parameter><valueName>s and <values> in their layers for which they are responsible for formally documenting. Examples of layer information include the SOREM Layer - Broadcast Immediately value, Environment Canada's addition of warning/watch/advisory values for weather alerts, and Natural Resources Canada earthquake magnitude in their CAP alerts. Consistent with Extensible Mark-up Language (XML) practices, alert recipients may simply ignore elements they do not recognize, which means that the addition of “layers” does not impact the integrity of CAP, so long as they are implemented in compliance with CAP accepted practices.